It has left me languishing so lonesome and so blue. So I called up all my girlfriends; I said, "Introduce me, please. You've gotta know someone who's gotta have something in common with me." Which gets longer and longer and longer the longer I live on this earth? Details of the lives of the strangers that I've encountered on my search? I'm in a Mexican restaurant with a friend of a friend of a friend. He's been burned so many times he's scared to try again. 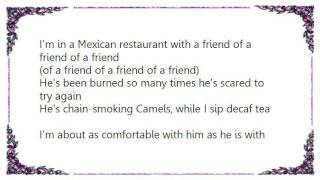 He's chain-smoking Camels while I sip decaf tea. I'm about as comfortable with him as he is with me. Which gets longer and longer and longer the longer he lives on this earth? Details of the lives of the strangers that he's encountered on his search? I have put on some makeup; I have combed my hair. I'm standing in a museum; this guy is twenty-five minutes late. Patience is a virtue I have never possessed; I'm giving up on this date. But wait! Here he is approaching. He smiles, French-kisses my hand. We wander around; we're gazing at paintings I cannot understand. So I ask a whole lot of questions, but it turns out that he hates art. Oh, the lives of the strangers that we encounter on our search. Publisher(s): Reservoir Media Management (Ireland) Limited, Cl2, BMG Rights Management (Ireland) Ltd.